When an airplane enters a climb, it changes its flightpath from level flight to a climb attitude. In a climb, weight no longer acts in a direction solely perpendicular to the flightpath. When an airplane enters a climb, excess lift must be developed to overcome the weight or gravity. This requirement to develop more lift results in more induced drag, which either results in decreased airspeed and/or an increased power setting to maintain a minimum airspeed in the climb. An airplane can only sustain a climb when there is sufficient thrust to offset increased drag; therefore, climb rate is limited by the excess thrust available. Normal climb—performed at an airspeed recommended by the airplane manufacturer. 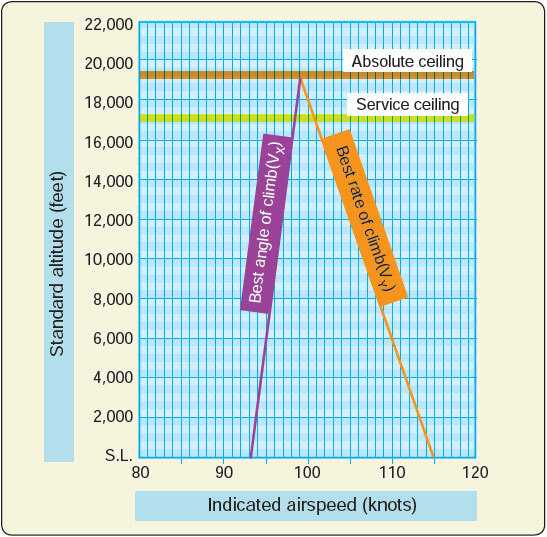 Normal climb speed is generally higher than the airplane’s best rate of climb. The additional airspeed provides for better engine cooling, greater control authority, and better visibility over the nose of the airplane. Normal climb is sometimes referred to as cruise climb. A straight climb is entered by gently increasing back pressure on the elevator flight control to the pitch attitude referencing the airplane’s nose to the natural horizon while simultaneously increasing engine power to the climb power setting. The wingtips should be referenced in maintaining the climb attitude while cross-checking the flight instruments to verify performance. In many airplanes, as power is increased, an increase in slipstream over the horizontal stabilizer causes the airplane’s pitch attitude to increase greater than desired. The pilot should be prepared for slipstream effects but also for the effect of changing airspeed and changes in lift. The pilot should be prepared to use the required flight control pressures to achieve the desired pitch attitude. If a climb is started from cruise flight, the airspeed gradually decreases as the airplane enters a stabilized climb attitude. The thrust required to maintain straight-and-level flight at a given airspeed is not sufficient to maintain the same airspeed in a climb. Increase drag in a climb stems from increased lift demands made upon the wing to increase altitude. Climbing requires an excess of lift over that necessary to maintain level flight. Increased lift will generate more induced drag. That increase in induced drag is why more power is needed and why a sustained climb requires an excess of thrust. For practical purposes gravity or weight is a constant. Even using a vector diagram to show where more lift is necessary because the lift vector from the wings is no longer perpendicular to the wings, therefore more lift is needed from the wings which requires more thrust from the powerplant. The power should be advanced to the recommended climb power. On airplanes equipped with an independently controllable-pitch propeller, this requires advancing the propeller control prior to increasing engine power. Some airplanes may be equipped with cowl flaps to facilitate effective engine cooling. The position of the cowl flaps should be set to ensure cylinder head temperatures remain within the manufacturer’s specifications. Engines that are normally aspirated experience a reduction of power as altitude is gained. As altitude increases, air density decreases, which results in a reduction of power. The indications show a reduction in revolutions per minute (rpm) for airplanes with fixed pitch propellers; airplanes that are equipped with controllable propellers show a decrease in manifold pressure. The pilot should reference the engine instruments to ensure that climb power is being maintained and that pressures and temperatures are within the manufacturer’s limits. As power decreases in the climb, the pilot must continually advance the throttle or power lever to maintain specified climb settings. The propeller effects during a climb and high power settings must be understood by the pilot. The propeller in most airplanes rotates clockwise when seen from the pilot’s position. As pitch attitude is increased, the center of thrust from the propeller moves to the right and becomes asymmetrical. This asymmetric condition is often called “P-factor.” This is the result of the increased AOA of the descending propeller blade, which is the right side of the propeller disc when seen from the cockpit. As the center of propeller thrust moves to the right, a left turning yawing moment moves the nose of the airplane to the left. This is compensated by the pilot through right rudder pressure. In addition, torque that acts opposite to the direction of propeller rotation causes the airplane to roll to the left. Under these conditions, torque and P-factor cause the airplane to roll and yaw to the left. To counteract this, right rudder and aileron flight control pressures must be used. During the initial practice of climbs, this may initially seem awkward; however, after some experience the correction for propeller effects becomes instinctive. To return to straight-and-level flight from a climb, it is necessary to begin leveling-off prior to reaching the desired altitude. Level-off should begin at approximately 10 percent of the rate of climb. For example, if the airplane is climbing at 500 feet per minute (fpm), leveling off should begin 50 feet prior to reaching the desired altitude. The pitch attitude must be decreased smoothly and slowly to allow for the airspeed to increase; otherwise, a loss of altitude results if the pitch attitude is changed too rapidly without allowing the airspeed to increase proportionately. After the airplane is established in level flight at a constant altitude, climb power should be retained temporarily so that the airplane accelerates to the cruise airspeed. When the airspeed reaches the desired cruise airspeed, the throttle setting and the propeller control, if equipped, should be set to the cruise power setting and the airplane re-trimmed. In the performance of climbing turns, the following factors should be considered. With a constant power setting, the same pitch attitude and airspeed cannot be maintained in a bank as in a straight climb due to the increase in the total lift required. The degree of bank should not be too steep. A steep bank significantly decreases the rate of climb. The bank should always remain constant. It is necessary to maintain a constant airspeed and constant rate of turn in both right and left turns. The coordination of all flight controls is a primary factor. At a constant power setting, the airplane climbs at a slightly shallower climb angle because some of the lift is being used to turn the airplane. All the factors that affect the airplane during level constant altitude turns affect the airplane during climbing turns. Compensation for the inherent stability of the airplane, overbanking tendencies, adverse yaw, propeller effects, reduction of the vertical component of lift, and increased drag must be managed by the pilot through the manipulation of the flight controls. Climbing turns may be established by entering the climb first and then banking into the turn or climbing and turning simultaneously. During climbing turns, as in any turn, the loss of vertical lift must be compensated by an increase in pitch attitude. When a turn is coupled with a climb, the additional drag and reduction in the vertical component of lift must be further compensated for by an additional increase in elevator back pressure. When turns are simultaneous with a climb, it is most effective to limit the turns to shallow bank angles. This provides for an efficient rate of climb. If a medium or steep banked turn is used, climb performance is degraded or possibly non-existent. Attempting to establish climb pitch attitude by primarily referencing the airspeed indicator resulting in the pilot chasing the airspeed. Applying elevator pressure too aggressively resulting in an excessive climb angle. Inadequate or inappropriate rudder pressure during climbing turns. Allowing the airplane to yaw during climbs usually due to inadequate right rudder pressure. Fixation on the airplane’s nose during straight climbs, resulting in climbing with one wing low. Failure to properly initiate a climbing turn with a coordinated use of the flight controls, resulting in no turn but rather a climb with one wing low. Improper coordination resulting in a slip that counteracts the rate of climb, resulting in little or no altitude gain. Inability to keep pitch and bank attitude constant during climbing turns. Attempting to exceed the airplane’s climb capability. Applying forward elevator pressure too aggressively during level-off resulting in a loss of altitude or G-force substantially less than one G.